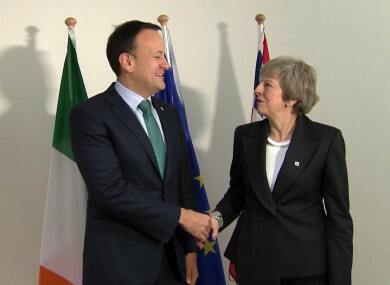 Britain's Prime Minister Theresa May shakes hands with Irish Prime Minister Leo Varadkar in Brussels. 13 December. BRITISH PRIME MINISTER Theresa May has said that she doesn’t expect an immediate breakthrough when she meets EU leaders today in an attempt to save her Brexit deal and her career. The British leader, who survived a confidence vote staged by her own party’s MPs late last night, now needs to turn a narrow victory on home turf into an unlikely away win. May’s 27 counterparts will join her in Brussels for a EU summit less than three weeks after a 25 November meeting at which they approved the Brexit divorce papers. An Taoiseach Leo Varadkar is also in Brussels with Minister for European Affairs Helen McEntee for series of meetings with the European Council today and tomorrow. The Taoiseach met with May briefly this morning: the two were due to meet in Dublin yesterday, but the visit was cancelled due to a sudden vote of confidence in her leadership of the Tory party. May is also due to meet with EU chief negotiator Michel Barnier before they join other leaders to try to find “reassurances” that the backstop in the Brexit deal – measures to prevent the return of a hard border with Ireland – will not last indefinitely. Speaking to reporters in Brussels today, May admitted that she didn’t “expect and immediate breakthrough” when she met leaders today. “My focus now is on ensuring i can get those assurances that we need to get this deal over the line because I genuinely believe that it’s in the best interests of both sides… to get the deal over the line and agree a deal,” May said. “But I recognise the strength of concerns in the House of Commons and that’s what I’ll be putting to colleagues today. I don’t expect an immediate breakthrough but what I do hope is that we can start to work as quickly as possible on the assurances that are necessary. May said that her primary focus was to “get the deal over the line”. She also confirmed that she would not be leading the Conservative Party into the next general election. “Yes I’ve said that in my heart I would love to be able to lead the Conservative Party into the next general election but I think that it is right that the party feels that it would prefer to go into that election with a new leader,” she said. A schedule for the House of Commons published today showed that the coming week has been filled by other draft legislation, meaning that the UK’s vote on whether to approve the Brexit deal won’t happen until the New Year. The parliament returns after the Christmas break on 7 January, and May has promised to hold the vote by 21 January. The agreement on the backstop and the Brexit deal was hailed as the end to a 17-month negotiation, and leaders dared hope they had saved Britain from crashing out of the union on 29 March with no ongoing trade arrangements. But when May brought the hard-fought compromise back to Britain she ran into renewed opposition from hardline Brexiteers on her own backbenches and balked at putting it to parliament. EU negotiators said the leaders would listen to May and see what they can offer her in terms of a statement, but insist the 585-page withdrawal agreement itself cannot be renegotiated. “The margin is really tight, it will be an exercise in presentation,” one senior European diplomat confided Wednesday. They will, however, hear May out, setting aside time today during a summit they had hoped would deal with migration, budgets and eurozone reform to talk about Brexit once again. “The discussions in Britain… do not make the situation any easier, but we should nevertheless do everything we can to avoid a hard Brexit,” Austrian Chancellor Sebastian Kurz said. Austria holds the rotating EU presidency and Kurz arrived in Brussels ahead of the summit to talk with host Donald Tusk, the president of the European Council, about the agenda. “It is clear that the withdrawal agreement will not be opened up and amended but there are, of course, other ways of moving towards one another that are in the interests of both sides,” Kurz said. After May made a desperate three-capital European tour on Tuesday to seek assistance from fellow leaders, Tusk had said he would love to help her, but “the question is how”. Yesterday, Kurz suggested the secret may lie in the question of the backstop. I think there is a certain room to move towards each other. But determined to remain loyal to continuing member Ireland, European officials insist in public and in private that the backstop must stay. “The idea of a sell-by date won’t stand,” one said. And any modification or addendum to an agreement on plans for future UK-EU relations will not be legally binding, negotiators say. Anything May does come away with must convince her own party, its angry Northern Irish allies and a majority of British MPs to back the deal if and when it returns to Westminster. If the agreement is still found wanting not only would Britain and its main trading partners face economic chaos, but May could be finished off by a parliamentary vote of no confidence. She said yesterday she wanted to “get on with the job of delivering Brexit”, and to see “politicians on all sides coming together”. But her hardline opponents claimed the vote against her had been higher than expected and that most back members – who do not hold jobs in May’s government – want her gone. “She ought to go and see the Queen and resign urgently,” leading Brexit rebel Jacob Rees-Mogg told the BBC. Eurosceptics hate the divorce deal agreed last month, which they fear risks tying Britain to the bloc for years after Brexit. Their confidence vote followed the prime minister’s decision on Monday to postpone a planned vote in the House of Commons in the face of what May feared would be a crushing defeat. She has promised to hold that vote before 21 January – when she may yet still lose, plunging the Brexit process into a fresh crisis. Email “Theresa May says she doesn't expect an 'immediate breakthrough' on Brexit deal at EU”. Feedback on “Theresa May says she doesn't expect an 'immediate breakthrough' on Brexit deal at EU”.